My puppet performing in Germany! I just learned about it. I'm thrilled! This is a puppet I built for another show (Jolis Deuils), which they chose for that event. They are offering me royalties for this too, even though it's just one puppet out of many I built for the show, years ago. This company has always been a great example of fairplay. A multiple opera concert with about 60 musicians and a choir. Two puppeteers (Pier Dufour and Louis Ayotte, of Kobol Marionnettes). My puppet on stage, and projected on a giant screen. The puppet interventions are used to link the different opera excerpts. They might perform this concert again. Click on the page numbers below the image group. There are 72 images, a few of which feature the puppet interventions. There's a way to glue strands or bunches of hair to a surface using hot glue, without it showing. It looks almost like the hair has sprouted from the skin. I usually do this after my puppet heads are painted. Since artist quality acrylic paints are extra strong and grabby, they won't peel off if a bit of tension is applied to the hair. -spread glue around the roots using the glue gun's nozzle. -immediately place hair bunch's root where you want it, and tap once or twice with moist fingers. The moist fingers are protected from the heat, and the texture makes the glue "matte". The water dries super fast. Strands can be grafted at various angles too, including as a totaly vertical bunch (great for punk hair and such). One has to experiment a bit to find out how much glue is just right. Excess will squeeze out and look bad. I leave the backing on the fur for larger areas, but the eyebrows and other facial hair are usually backing-free. I add backing-free strands of hair in front of the hair line to hide the backing's edge and make it look like natural growth. 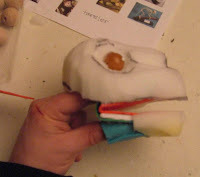 For an even more realistic look, I sometimes use Monster Bone as a glue to attach simple strands of hair. Like I described for the hot glue, I apply the Monster Bone compound to the root of the hair strand, ans squish it in place. Then I paint a bit of it to overlap the hair and the scalp. I need to be sure not to touch it at all until totally dry, but when it is, the hair won't come off, and will definitely looks like they are sprouting out, hair by hair, or at least very small strands by very small strands. 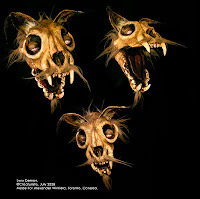 The lynx demon puppet shown below has a mustache made that way. The bowl of water should always be there whenever we use hot glue. Any spill on our skin can be immediately dipped in water and the burning stopped. I've proven it to a group of students once. They looked both distracted and incredulous, so I dropped some hot glue on my hand on purpose, and dipped in water. No damage. That got their attention. Leave the glue on the skin until totally cool, or a bit longer even. Premature removing of the glue can rip off the epidermis. It happened to me twice. It did not bleed, but the exposed inner layers of skin were hyper sensitive to heat and touch, until it healed. I'd rather take the extra time to prepare a bowl of water than to have to go through the irritation again. Hobey Ford tells me of an extra safety measure: we should deposit the gun on its stand before dipping our hand in water (electric shock risk if gun cord is damaged) . For an example of the hair grafted in this manner, look at my demon puppets. I think a big portion of the touring theater companies/puppet makers that have a website have a major problem. Whether or not they have a decent interface (which is also important), the pics are often too small, and/or badly taken, and/or too few in numbers. I'm sure people who book shows or order puppets really appreciate good quality material to help them make a decision about what to purchase, and whom to book. It was taken with a super cheap point and shoot camera, with extremely poor lighting conditions in the studio. These things were out of my control. I was working abroad and we were in a rush, so no time to get better lamps. I would not show this on a pro website. Might as well not show anything at all. Alas, this set of photos is mostly so bad I'd have a hard time getting anywhere close to acceptable quality, even after lots of tweaking. This was taken with a good camera, but in poor lighting condition, and without a proper neutral background.So the subject is badly lit, and the background is competing with it. This is what happens when we are too lazy to setup properly. I tweaked the pic to show what a big difference a little tweaking can bring.But save yourselves most of the tweaking trouble, just take the time and effort to take better pics! Of course, there are exceptions. I always try to take the best photos possible, but I do admit to neglecting it a bit when taking works in progress, especially if I know they won't be published online. Recently, that laziness came back to haunt me. A customer wants to use one of my "lazy" work in progress pics, on their event's poster. I think the photo and the work(at that stage) both look awful. I tried to dissuade them, but they held on to their concept. I hope they tweak the picture a LOT, to reveal less defects,as I suggested. I'm not talking about photographing every single puppet in every single angle, using the services of a pro photographer. That would probably be overkill, and overly expensive to most. I'm talking about taking the time to make your puppets look their best in photographs, truest to what they look like in person, and/or on stage. It will inspire more people, and even bring you more bookings and more commission work. As a total fan of admiring other people's works, I truly enjoy when I see quality photographs of quality puppets. If you don't enjoy taking pics at all, you could exchange services with someone who does enjoy it, and knows how to do it. A lot of people have family members or friends who are pretty good at taking pics. I'll be sharing tips here (below) that could help beginning photographers become much better, in no time at all, with just a little effort. I know they work, I learned those tips the hard way. My first puppet and mask portfolio dates back to 2001. It cost me over a hundred dollars just in film and processing. I really wanted it to look good,so I took many shots with my 35mm camera. It still ended up looking a bit cheap, as I didn't know much about doing good photography without the pro equipment I had been taught to use in College, but could no longer afford. Still, when I look at people's websites today, I see many photos that are just as bad as mine were when I spent so much time and energy on that first portfolio. Get a decent digital camera of a good brand, with at least 6 megapixels of resolution. I recommend cameras by Nikon, Canon, and Pentax. Right now, I have a Pentax k100-D, and I love it. I chose it among other because it was the only full manual camera that used regular AA batteries as a power source.Proprietary batteries are a money-making scheme that makes it very inconvenient to get replacements (special orders), especially on tour or trips.So that's why I took the extra time and effort to find a camera that worked with regular batteries. But you don't need to spend 600$ on a camera to get good shots. Maybe 200$-300$ would be an acceptable lower price range for puppet companies who want real good quality. This is the only "expensive" investment in these tips. Using your camera's Manual Mode (if it has one) and knowing how it works will save you a lot of headaches, and give you total image control. I was stubborn with my first digital camera, and waited for one year before really reading the camera's instructions manual. I realized only then that I had been missing out on a lot more picture quality! It suddenly felt like I had gotten a much better camera. Still, knowing the options on your automatic modes will help you get better pics, every time, by choosing the right mode for the right lighting situation. A good capacity removable memory card is a good investment. It is very frustrating to run out of card space when everything else is going right. An extra card can't hurt either. Usually, the card that comes with the camera is nowhere near a decent capacity, so spend the extra 30 or 60$ to get a large capacity card at the moment of purchase of the camera (some places will give you a rebate if you ask for it at that big purchase time). If your camera is one of those pocket-sized extra lightweight, it could have a stability problem, making your shots fuzzy. A friend of mine has a much better resolution on his camera than mine. When I use his camera, even with all my tricks, I find it near impossible to get a good shot without a tripod. Adding a bit of weight underneath it (using the screw hole meant for attaching to a tripod) would help stabilize it when not using a tripod. This inspires me to build him such a weight device as a gift, or at least a rope tripod. The git is for me too, as I am his usual graphic designer, and his fuzzy pics are slowly making me lose my mind. This will vary a lot depending on your camera and lighting conditions/equipment. To make things short here,I'll give you my preference for best sharpness and finer grain. It will differ for many people, so experiment. White Balance: adjust according to your lighting types ( Incandescent, Fluorescent, Daylight, etc...) You can also play with different light types in the same pic: daylight is more blue than incandescent, for example, so in the same image, you can have sunlight from the window on one side, and a lamp on the other. ISO: 100 or 200 (finest grains on most cameras) . You'll need more light in the studio for this ISO setting, and you'll need to close your aperture if working in bright outdoors condition. Aperture: as low a number as possible without losing depth of field (the smaller the subject, the less depth you need to have everything in focus). For my average sizes, I open the aperture to the max (lowest number, in my case 3.5)Picture quality: as much as you need. In my case, I use the maximum format as possible without it being RAW, which would be overkill, since it does not change the pic quality for my uses. A full quality JPEG from my 6 megapixel camera can probably be printed tabloid-size without any loss of sharpness, which is more than I usually need. You absolutely need one if you want really sharp, focused pictures with all the details. It also saves us in limited lighting conditions, because it permits stability during longer exposure times. Anything stable will do. You can even make your own, by adding proper hardware (quarter inch bold and three hex nuts) to at all piece of furniture. Still, an actual tripod with adjustable angles will be very practical, and portable. My main tripod is an old video camera tripod, from which I removed the super strong spring which was for stabilizing heavy video cameras. Now I can use it for my digital photo camera without needing superhuman strength. Digital photo cameras are very needy in terms of light, no matter what mode you use. Yet it is even more important if you use the automatic modes, because it will try to compensate in lack of light, and give you very grainy images as a price for versatility. Get one very strong light source, and two or three medium strength sources. That's for studio work, and to control your environment better, either work in a room where no outside light can come in, or work at night with curtains closed. When working outdoors, use what sunlight is available, and better yet, go take pics at times when you have the best type of light for the project you have. An overcast but bright day is really good for a diffused light situation, it will cast only soft shadows. I like bright sunlight too, but for those moments, I'll take my pics slightly in the shade. Note: Winter temperatures will make your camera's batteries temporary feel drained, very fast. They will regain some of their vanished charge when they get back to comfortable room temperatures. My main light source is a halogen work light, with twice 300W bulbs. My secondary sources are two desk lamps. In one I put a 100 watt bulb, in the other, a 60W. Some people are very happy with using colder light sources, such as fluorescent. They cast a more even diffused light, which can be very flattering to most subjects. I don't yet go for those, because I hate their blueish cast, and the headaches that they sometimes cause. The blue temperature of these lights are not seen on the final pics, as most good cameras have a light temperature adjustment, and/or you can use a photo software to correct it.For now, I'll keep with my yellowish incandescent lights, and just be careful when handling them, as they get pretty hot. Should I use a flash?If you can avoid using the integrated flash into your camera, please do so! An integrated ruins most shots,by flattening volumes, inventing textures, and making everything look bad.You don't need a flash if you have the light sources (or similar) mentioned above. If you have an independent flash you can position anywhere and still work with your camera (pricey! ), you can use it instead of your main light, with great results. If you must use the integrated flash, diffuse it by placing a white sheet of paper in front of it. play with distance and angles to see what works best for your subject. Be careful, the flash's light often bounces off the sheet into your eyes, so better close them at the last nanosecond. Reflectors:Any large opaque white (or other light color) panel can be used to bounce some light into the shaded areas, so as not to loose details and definition. Different surfaces will give different effects. Lots of people like to use white Foamcore, because it bounces light softly. Many white surfaces will work.For even more reflective power, some shiny metallic surfaces are very helpful. Car window reflectors(one side gold, one side silver) have been adopted by many pro photographers as cheaper alternatives to the studio product. I use a black Theater curtain for most of my puppet and mask pics. It's always set up, I use it to splits my main room into two. It will also make a great background for videos. I love it because it blocks all the street light, I can sleep in near total darkness. Best investment in years! Sometimes I'll use a white panel as a background. For very small objects, I'll use a home made light tent. Many tutorials are available online for free, to build your own light tent. It makes a world of difference to have those two walls and ground all white, bouncing the light all around your subject. You also need less light when using the light tent, and it can serve as a light diffuser if lit from behind. I also like to go outside and use various natural or human-made settings as background. I take those as extra shots, and as a fun artistic activity, but I still take the controlled studio shots. I don't use special effect filters, as I want sharpness to better represent my creations. Less is better. I would however sometimes use filters and attachments that enhance the clarity or quality of my pics,if I had any. Examples: macro filters, basic color filters to bring out or eliminate a certain color range.For artistic shots not meant to feature the puppets in precision, anything goes: nylon sock over the lens(or other material), blowing some condensation over the lens for a few seconds of blurry fog effect. Main light source is usually set higher than my subject (think "like the sun"), either hung from a wall,installed on a tripod, or on my sculptor's trestle, pointing at my subject. Experiments are necessary to see what is the right distance for the ideal light level without having a hot spot (which would destroy details in lighter areas) My secondary light source is set on one side, at about a 45 degree angle,pointing to my subject. If I have a third source, it's set anywhere I need it, but further away from the subject, to make it softer. It's called a "filler". A filler can also be used behind the subject, to light the hairs, and make them visible against a background that would be too close in color to it. My camera is set (usually on the tripod) at the best angle to see the puppet. Usually for me, that means I center my subject in plenty of empty space around it. I take my pics at full quality (although not RAW, which I don't need) a bit further away from my subject, to avoid lens distortion. I can crop closer(removing extra frame) in a photo software later. when everything looks good in the viewfinder or the LCD screen, just press the button.If the tripod isn't all that stable, use the delayed shutter release, so that it will have time to settle between the button click and the shot being taken. I use the multiple shots options when I can't really use a tripod. It takes more than one shot every time I click the button. So even though I move, one of those shots is probably more focused than others. It enables me to select the best, sharpest pic of the bunch. Holding my breath before I click is also a good way to limit unwanted movements. Some people like to use a rope tripod, which is very simple to make. Here's a tutorial on making a rope tripod. Get used to how your camera's LCD screen displays your photos, and know how to preview the pics, and zoom them to the max. This will help you judge to see if you have proper focus, light, and sharpness, letting you know if you can move on to the next subject, or take extra pics for safety. Use your camera's cable or a card reader if you have one on your computer. The first step I do is to rotate the pics so that they are all upright, as they were intended, if the camera doesn't do it automatically (mine doesn't). Some free software are available for this. I use Rota, which does it without any loss to the picture quality. It doesn't say so, but it only works well if less than 100 pics are processed at a time (otherwise, some of the later pics are not processed). Then I take each pic at a time into a photo software (Photoshop, Photoshop Elements, The Gimp, etc), and adjust the levels, add a bit of saturation, a bit of sharpness, and eliminate defects, such as dust particles, distracting reflections, and even gadgets I might have used to hold the puppet in place for the shot. I rarely resize a pic at this stage,as I want full size and resolution fro my archives. But if I do resize, I do so under another name, in another folder, to keep the good stuff good. Every time I resize, a subtle application of sharpening is required,otherwise you lose some finer details and textures. I save each pic under a clear, recognizable name, in a different well-named folder. These are ready for printing. But I also use them as originals, to make my web version and photo montages from. Depending on the destination of the pics, you can choose what resolution you give them. Some online services such as Facebook will reduce your pic sizes automatically, so don't expect huge full screen pics. Better host your best work somewhere else, and link to it. Most website pics are still at 72 dpi of resolution,although some are at 79 or 96dpi. These are good resolutions for screen viewing, if the pic is big enough in pixels to see the pic clearly. It's safer to use this resolution, unless you want people to start printing your full resolution pics for their own "not always legit" use. If you want to risk it, you can post full resolution pics (300 dpi and up) to your own advantage, like when you want customers to print your posters themselves for an event, or for press purposes, so they can display the best quality possible in their article or TV show. A full resolution is also much appreciated when you supply free stuff to print out, such as patterns.My current average single pic for the web is at 72 dpi and is 700 pixels tall, and as wide as the screen allows.For a photo montage (portfolio), I try to use a size of 800 x 600, as it fits within most browser's main window without the need for scrolling.I hope this helps. It sure helped me.I get more bookings since I have better pics.With the first portfolio, some people commented online about such and such puppets, and a few months later, when seeing them in person, they had forgotten they had seen them before.People now remember my puppets from the pics, which is reassuring! If you are in a hurry, or just prefer to have someone do it for you, I can calibrate photos for you. Contact me with an example of what photos need to be done, for more info and pricing. Caricature (esquisse) de l'humoriste québecois André Sauvé. La prochaine caricature me verra pousser l'exageration davantage. Présentement, c'est plus près d'un portrait "libre". Le bût est d'utiliser la caricature comme un moyen pour rendre mes concepts plus "poussés", plus fous, tout en augmentant la ressemblance. Je préfère créer des caricatures qui ne sont pas méchantes envers le sujet. Caricature (sketch) of André Sauvé (Quebecois stand up comedian). It's a personal challenge to develop skills. 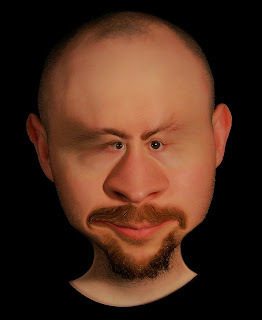 Nextcaricature I make, I'll push exaggeration much further. Right now, it's closer to a loose portrait. 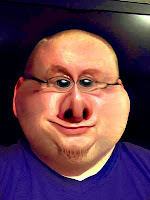 The goal is to use caricature as a way to make my designs bolder, wilder, with even more likeness. I mostly want to make caricatures that aren't mean to the models. 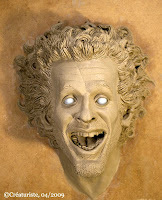 This one would make a nice animated portrait puppet (head reproduced in latex rubber, emerging from picture). I was playing, in Photoshop, with my profile picture for Facebook (result on the left), when I realized a huge potential for a tool some of us may not have even tried, or have taken for granted. It's called Liquify, and it's a filter in Photoshop 7 (and above). Earlier version might not have this filter. Photoshop Elements 6 is said to have that same feature. Download Photopshop Elements (30-day trial) by doing a search for it online. Easy to find. If you like it well before the end of the trial period, and can't pay for it, you may get a full version for free when you buy a graphics-related peripheral (got mine with a scanner or printer, don't remember). 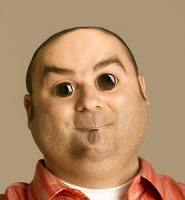 I will now use the Liquify tool when customers aren't sure of the type of character they need, but have some celebrity or acquaintance in mind for the kind of face they want. I tweak it until we have a style, and can then move on to clay! Also very useful when I get a contract for a caricature-puppet! You take a good quality picture of someone or some animal and tweak it, using the brush, and attacking it with various degrees of "brush strength" and brush sizes. For even more fun and ease of face tweaking, try the neat automatic tools at the left of the filter's window. Leave the mouse cursor idle on it for a few seconds to learn their names (warp, turbulence, twirl, pucker, blaot, shift pixels, reflection reconstruct, freeze, thaw). For these tools, make sure you center the cursor on the item you want to warp, if a precise application is what you seek. For instance, the Bloat tool, centered on the eye's pupil, will enlarge the eye very precisely. The reconstruct tool is very useful, using it you restore the painted area to what it was before the tweak! Don't forget to zoom-in with the magnifying glass tool when you need precision. Very necessary when working with a mouse. All this allows us to easily tweak an already existing face (or body! ), and still keep the believability of it. The resulting images can be very high resolution (as high as your original picture), and used as bases to build our puppets, either in a clay model, or directly in the medium of your choice. I've done it quite easily with the mouse, but I know some people may only find true control and satisfaction with a graphic tablet. This filter requires a lot of computer memory. The bigger the image resolution, the more memory is required. On my version of photoshop, the filter automatically quit when it ran out of memory, making me loose my tweaks! As a safety precaution if you have limited hardware on your machine, save your results in stages, to tweak only a few features at a time. This is my first "serious" try of this filter. I never actually noticed the extra options on the left! I'd have loved to find out about this years ago!!!! In my defense: I've gotten quite good at the steps I do very often in Photoshop, and they serve my purposes. It's easy to get lost in all the options in sub menus, so it's been a while since I truly explored. I made them very quickly, so some weird artefacts remain. 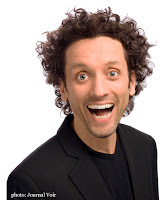 Laurent Paquin (local stand up comic)gets a baby face (bigger face, cute small mouth, rounder everything). 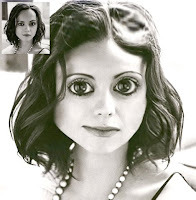 Christina Ricci was modified subtly. Bigger eyes, smaller chin. I was able to change her mouth's expression, and tweak her hair. Just a few tweaks, and she no longer looks like herself. I'm a fan of her work (and face), so tried not to damage her too much. LoL. 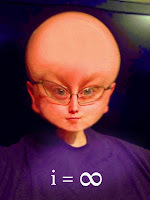 Then a another self-mutilation, this time as a bearded-baby-alien-human-hybrid. And now, Julian Beck has a more in-depth transformation.